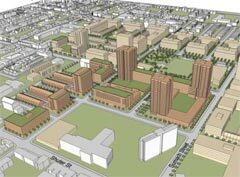 In rebuilding Regent Park, the city is planning a mix of subsidized housing (also known as RGI: “rent geared to income”, or rental) and “market value (or “owned”) housing. The city also talks about an “affordable ownership” option: some sort of subsidy in the form of a 2nd mortgage, to enable more moderate income households to buy a “market value” condo. 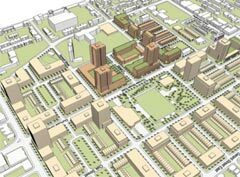 In Regent Park Phase 1, which is currently under construction, the plan is for 350 rental and 600 “market value” – although to date, 5 years after the start of this project, no one has purchased any of the “market value” housing units. In Phase 2, the plan is for 380 rental and 1270 “market value” units (on land currently occupied by 444 “old” Regent Park” rental units). The existing community centre: 203 Sackville Green (still in good repair, perhaps 30 years old) will be demolished, and a new facility built approximately 1 block south. This will be in addition to other Regent Park “community centres”: the Aquatic Centre, and the “Day Care / Parents for Better Beginning”, both soon to be under construction elsewhere in the Regent Park site. In the surrounding neighbourhoods of Cabbagetown and Trefann Court, Sumach and Sackville Streets are quiet, one way streets. In Regent Park, both streets will become 2 way traffic. The existing apartment tower, at 14 Blevins, will be retained due to its architectural significance. Sackville Street is to be lined with 8 storey buildings, comparable in height to the 90 Sumach condos. The block bounded by Shuter, Sutton and Regent St contains a mix of 2 storey private homes (372-376 Shuter, 29-31 Sutton) as well as 3 storey Regent Park townhouses (362-356 Shuter). The city has acquired 376 Shuter and 21 Sutton; when asked at the May 11 meeting, the city wouldn’t divulge its plans for reveloping this block. Where will the city get $450 million to pay for all of this? Magic. This entry was posted in development, Regent Park. Bookmark the permalink.